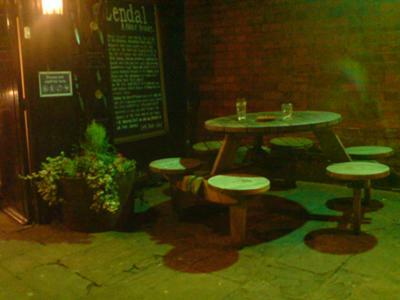 I was talking to the landlord of this pub in York, and he said it is haunted by several ghosts. Anyway I was sitting outside and took a pic with my camera phone. 4 ghosts and maybe more!! I see a man on a chair with straps around his legs and waist, then am older man standing behind him looking down on him, then to the left I see a man standing behind the sign with a white collar and a long black coat on. I see other thing on the wall but can't make them out. Give the ghost a beer and it won't hurt you. I see a bit of a fog by the table and a person hiding behind the sign, that's it, no ghost. Although I do believe in them, it's not so easy to get them on camera. I definitely see two ghosts there as another already commented one at the table and one peeking on the side of the sign. To the right of the screen is a lady in a neck kerchief or collar. I see a shadow right next to the second table. I can see so many ghosts in this photo, but can anyone else see the lady wearing black with a big white collar peeking out from behind the sign to the left? I believe in ghosts and paranormal things, and I have seen many photos, but I have never seen so many clear ghosts in one photo together. I can even see half a lady to the left of the sign, wearing black with a big white collar. Can anyone else? I believe in ghosts and paranormal things,and I have seen many photos,but I have never seen so many clear ghosts in one photo together. I can even see half a lady to the left of the sign,wearing black with a big white collar. Can anyone else? I can see two ghosts! If you look at the picture closely you can see one body and two faces!! One looks calm and one looks like hes shouting! Please comment if you can see it too!! I don't think it's a ghost at all. Wish we knew more about the pub. Care to share the backstory?